"A modern economist is used to measuring the 'standard of living' by the amount of annual consumption, assuming all the time that a man who consumes more is 'better off' than a man who consumes less. A Buddhist economist would consider this approach excessively irrational: since consumption is merely a means to human wellbeing, the aim should be to obtain the maximum of wellbeing with the minimum of consumption. . . . The less toil there is, the more time and strength is left for artistic creativity. Modern economics, on the other hand, considers consumption to be the sole end and purpose of all economic activity." "No system or machinery or economic doctrine or theory stands on its own feet: it is invariably built on a metaphysical foundation, that is to say, upon man's basic outlook on life, its meaning and its purpose." These and similar quotes from E.F. Schumacher's provocative book Small is Beautiful on ecological economics came to mind when we received today's package from Germany. A couple of weeks earlier, we'd visited the Paris audio show and met with Peter Grundig of Greatech, Grundig Radio Experts & Technology from Krefeld/Germany. At the show, he presented his μVAC Subminiature Class-A Single Ended integrated tube amplifier. The μVAC sounded very promising even though it was placed on a table in a hallway. So we made a review appointment. 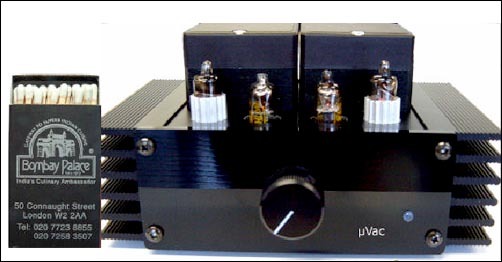 The μVAC is a two-box design, with separate housings for the power supply and actual amplifier. By housing we mean 140 x 85 x 90 mm for the 1.5 kg power supply and 140 x 85 x 75 mm for the 1 kg amplifier. Small indeed though relative heavy and well built. For such a pocket-sized piece of equipment, its looks are tough as evidenced by the heavy cooling fins on both units. 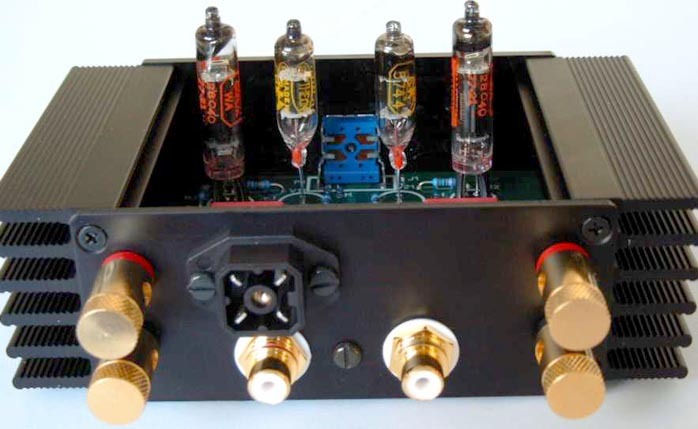 The amplifier is built around two types of subminiature tubes. 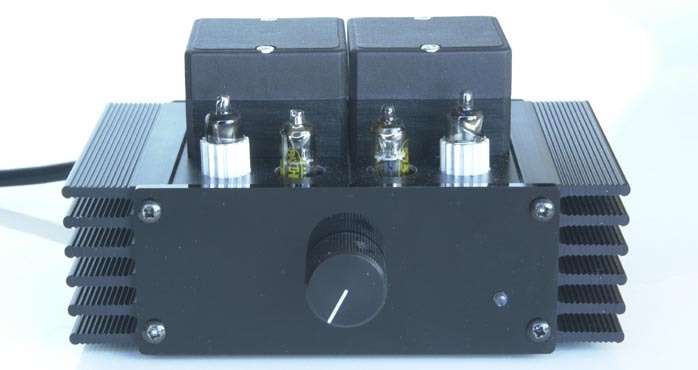 Greatech uses the high-mu 5744 triode in the preamplifier section and the 5902 beam power pentode in the output stage. 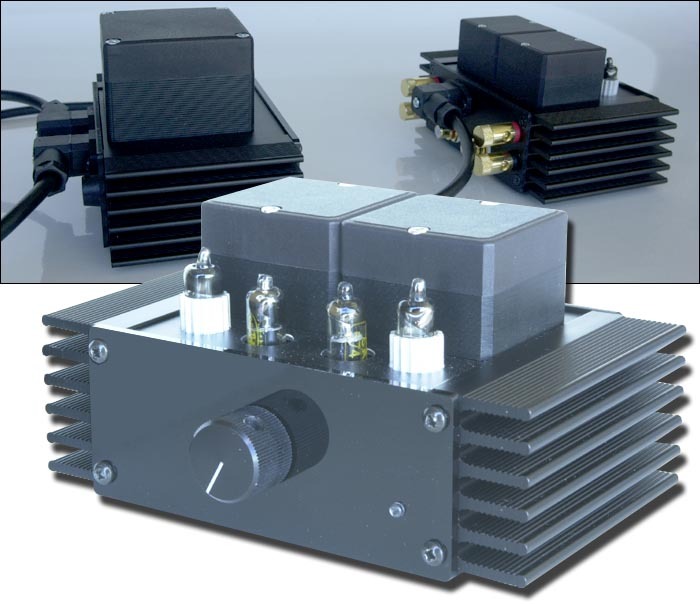 According to the manufacturer, the μVAC has an input impedance of 50Kohm and produces maximum output at 500mV. The German-issue output transformers deliver a maximum of 1 watt from the circuit. 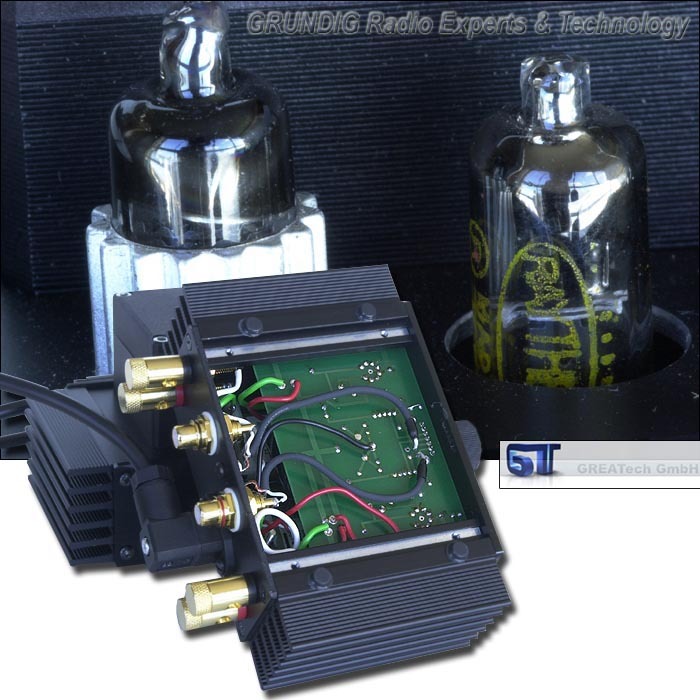 Greatech can build the amplifier for 4 or 8 ohms load impedance and there is a choice of 120 or 240 grid voltages. If you don't like the black faceplates, other colors may be ordered. The μVAC is fully hand-made in Germany and only available as a limited run of 250 pieces direct from the manufacturer. Subminiature tubes were designed during the Second World War when there was a need for rugged tubes to be used in artillery shells. A metal detector based on radio frequencies was placed inside the tip of the shell. The metal detector made the shell intelligent -- as far as any means of war can be intelligent -- and only exploded close to its metal target, not on impact. The tubes employed thus had to be of extreme ruggedness. They would be small, use heavy glass envelopes and no fixed pins that could break. Instead, these subminiature tubes were equipped with loose bare wires, which acted like shell shock absorbers in their original applications. Greatech assembles their limited edition of μVACs from their current supply of US NOS subminiature tubes. These tubes are long-lived affairs so no worries there. The two parts forming the μVAC connect via the umbilical power line between them while a mains cable is fitted to the power supply. Detachable screw terminals make the connections at the chassis. The front of the power supply uses the obligatory switch that triggers a little LED when engaged. 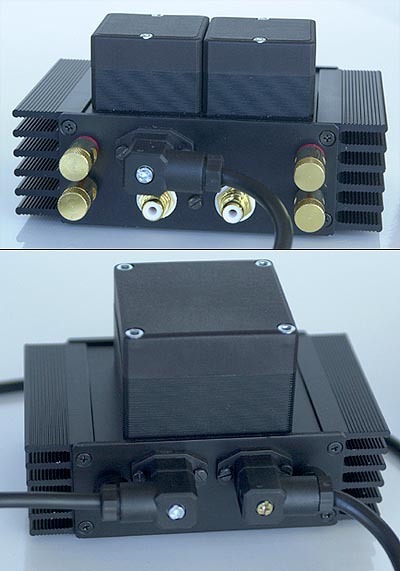 The amp half sports the attenuator on its black-anodized front and a pair of gold plated RCA inputs and two pairs of speaker terminals on the back. The terminals accept spades and bare wire. In our audio rack, the uVac was brutally dwarfed by everything else but because our main rig was busy with another assignment, this dwarf saw his first duty in another system. Loudspeakers were a pair of 93dB sensitive Audio Note AN/Jsp, with a Philips DV5505s SACD player as source connected with Crystal Cable Piccolo. Loudspeaker cable became a single pair of shielded Audio Note AN-L equipped with banana plugs that fit the μVAC's terminals sideways. Even though the amplifier is small, attaching the cables presented no problem. With the limited weight of the minuscule amplifier in mind, it is advised of course to support any attached cables so the amplifier isn't being pulled off the rack. With the volume control turned down to zero, we switched on power. The LED lit up as did the four tiny tubes if one looked carefully. We gave the μVAC some warm-up time before listening to the first CD. MoFi's remaster of Frank Zappa's We're only in it for the money seemed appropriate enough to start with. To achieve satisfactory SPLs, two o'clock on the dial sufficed in our 7.5 x 3.5 meter room lined with bookcases on three walls, sitting at 2.5 meters from the loudspeakers (multiply by three for approximate footage). Two other MoFi remasters followed, Blood Sweat and Tears and Edgar Winter, both tapped from their SACD layer. Turning the volume up even further simply became too loud. There was no noticeable distortion even flat-out but our ears clipped in the listening seat. The μVAC is capable of projecting a musical image with all the necessary details intact. The sound is clean and resolute without being over-detailed. On the low side of the spectrum, the tiny amplifier from Germany naturally lacks the big oomph larger amplifiers are capable of. The Audio Notes woofers require just a little more power than one solitary watt to reproduce solid bass. Nevertheless, the oh-so-important mids didn't sound scaled down at all nor did the treble. To determine whether the μVAC's limiting factor was truly the lowest region, the cute black combo returned to the main listening room. Here it hunkered down next to the Audio Note Meishu integrated which loomed forebodingly above it like the Alps over an ant. Drafted into connection duties was a pair of Stealth Indras while Crystal Cable transported the juice to our 103dB Avantgarde Duos, eight times as efficient as the Audio Note speakers. Below 170Hz, two 250-watt sub amps take over. 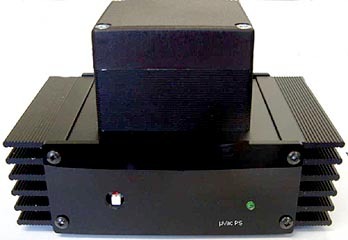 While the Duo subs are active, they derive their signal dispatched from our Philips SACD machine high-level directly from the μVAC, not a preamp. different. Horns -- even the very smooth Duo -- are simply far more direct (or in yer face as detractors would call it). We thus only listened casually for a while until our hearing had reacclimatized to hornloaded sounds. A careful 9 o'clock starting position anticipated that the full 1-watt output would prove deafening on this load. Schumacher's "consumption is merely a means to human wellbeing, the aim should be to obtain the maximum of wellbeing with the minimum of consumption" is ever so true with such speakers which really should be thought of as green from the energy consumption perspective. Stepping back from the comparatively gigantic 8 watts of our customary Meishu to the 1-watt flea power of the μVAC proved no backwards step at all. In fact, our musical level of wellbeing was maintained if not exceeded. More for less? Cutting back 80% by using resources more efficiently (here converting input power more effectively) is indeed satisfying and inspirational. Under these circumstances, who could possible need more than one watt in an ordinary room? The higher efficiency of the horns reveals more air around instruments, making them sound more natural as individuals. Next the Philips player got upstaged by our modded CEC/AN DAC combo with once again the Indra as interconnects. Though this is a CD-only source system, tone, timbre, rhythm and pace improved when compared to the SACD player reading CD.